Adrian David Cheok is Director of the Mixed Reality Lab and Associate Professor in the Department of Electrical and Computer Engineering, National University of Singapore. 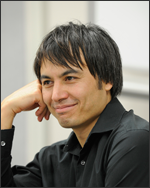 He was appointed to be a Full Professor of Graduate School of Media Design, Keio University, from April 2008. This talk outlines new facilities within human media spaces supporting embodied interaction between humans, animals, and computation both socially and physically, with the aim of novel interactive communication and entertainment. We aim to develop new types of human communications and entertainment environments using all the senses, including touch, taste, and smell, which can increase support for multi-person multi-modal interaction and remote presence. In this talk, we present an alternative ubiquitous computing environment based on an integrated design of real and virtual worlds. We discuss some different research prototype systems for interactive communication, culture, and play. Adrian David Cheok has previously worked in real-time systems, soft computing, and embedded computing in Mitsubishi Electric Research Labs (Osaka, Japan). He has been working on research covering mixed reality, human-computer interfaces, wearable computers and ubiquitous computing, fuzzy systems, embedded systems, power electronics. In the Mixed Reality Lab, he leads a team of over 30 researchers and students. He has been a keynote and invited speaker at numerous international conferences and events. He was invited to exhibit for two years in the Ars Electronica Museum of the Future, launching in the Ars Electronica Festival 2003. His works “Human Pacman”, “Magic Land”, and “Metazoa Ludens”, were each selected as one of the worlds top inventions by Wired and invited to be exhibited in Wired NextFest 2005 and 2007. He received several outstanding awards: A-STAR Young Scientist of the Year Award 2003, the SCS Singapore Young Professional of the Year Award 2004, Fellow in Education, World Technology Network in 2004, and Microsoft Research Award for Gaming and Graphics in 2005. He was also awarded the Young Global Leader 2008 by World Economic Forum.